^ 1.0 1.1 1.2 1.3 Rutter, Paul Professor; Newby, David. Community Pharmacy ANZ: Symptoms, Diagnosis and Treatment. Elsevier Health Sciences. 2015: 19. ISBN 9780729583459. （原始内容存档于2017-09-08） （英语）. ^ 2.00 2.01 2.02 2.03 2.04 2.05 2.06 2.07 2.08 2.09 2.10 2.11 2.12 2.13 2.14 Hildreth, AF; Takhar, S; Clark, MA; Hatten, B. Evidence-Based Evaluation And Management Of Patients With Pharyngitis In The Emergency Department.. Emergency medicine practice. 2015-09, 17 (9): 1–16; quiz 16–7. PMID 26276908. ^ 3.0 3.1 3.2 3.3 Weber, R. Pharyngitis.. Primary care. March 2014, 41 (1): 91–8. PMID 24439883. doi:10.1016/j.pop.2013.10.010. ^ 4.0 4.1 Jones, Roger. Oxford Textbook of Primary Medical Care. Oxford University Press. 2004: 674 [2016-08-04]. ISBN 9780198567820 （英语）. 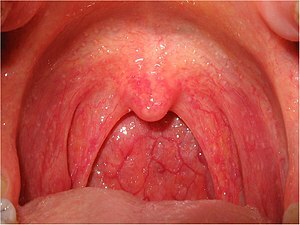 ^ Pharyngitis. National Library of Medicine. [2016-08-04]. ^ Marx, John. Rosen's emergency medicine: concepts and clinical practice 7th. Philadelphia, Pennsylvania: Mosby/Elsevier. 2010. Chapter 30. ISBN 978-0-323-05472-0. ^ Beachey, Will. Respiratory Care Anatomy and Physiology, Foundations for Clinical Practice,3: Respiratory Care Anatomy and Physiology. Elsevier Health Sciences. 2013: 5. ISBN 0323078664. （原始内容存档于2017-09-08） （英语）. ^ Hegner, Barbara; Acello, Barbara; Caldwell, Esther. Nursing Assistant: A Nursing Process Approach – Basics. Cengage Learning. 2009: 45. ISBN 9781111780500. （原始内容存档于2017-09-08） （英语）.